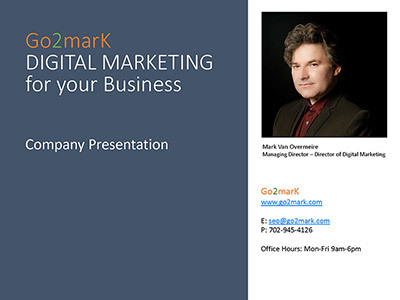 Go2marK offers digital marketing solutions covering every aspect of digital marketing. Depending on your needs this can be search engine optimization, pay per click, social media optimization or any other solution that needs attention to achieve the best result possible. It is important to focus on digital marketing solutions that bring you the best return on investment. Go2marK helps you determine what needs to be addressed first to achieve your goals. Before taking on your digital marketing project Go2marK determines what your goals are. Would you like top rankings in search engines such as Google, Yahoo! or Bing? Or reach a wider audience on social media such as Facebook, Instagram, YouTube or Twitter? More visitors? Or a higher number of conversions? You have a customer base and need great looking emails to promote your products or services? We understand that every business needs different digital marketing solutions to reach their goals. It is important that we analyze your current position in the digital market and based on this analysis offer you the solutions that will work for you to get the best return on investment.